Every four years, after each presidential election, there are newspaper op-eds claiming that the campaign that year was longer, nastier, and more divisive than ever. The truth of the matter is that presidential campaigns of the past could be just as long, nasty, and divisive as modern political contests. They certainly could be more colorful. The populist campaigns of the second quarter of the nineteenth century were marked by an explosion of material culture bearing slogans, icons, and portraits of the candidates. From hickory canes for “Old Hickory” Andrew Jackson in 1828 to log cabin carriages for William Henry Harrison in 1840 and glass flasks molded with battle cries surrounding the bust of Zachary Taylor in 1848, a full range of decorative and useful objects was fashioned to show partisan support that lasted well beyond an election. Material culture allowed a campaign to cross the threshold from the public sphere into the private home and become a part of daily life. Ceramics, textiles, and personal accessories populated homes with images of a favorite candidate. 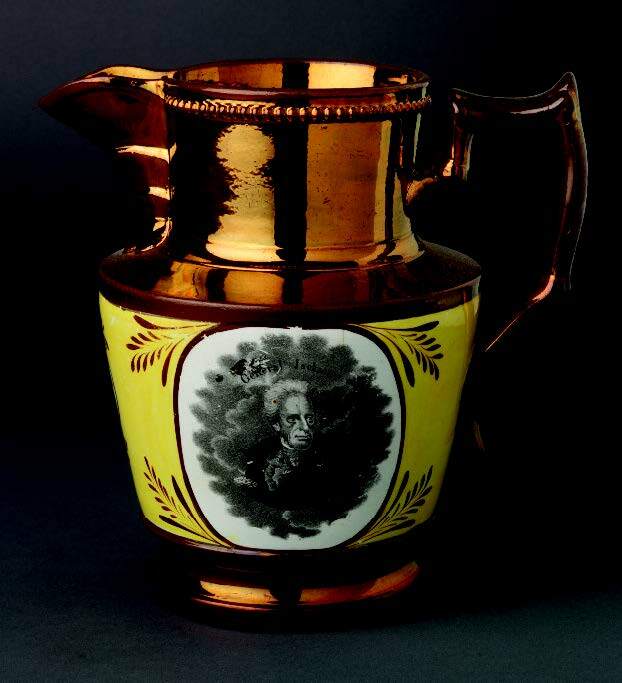 In the 1820s, copper lusterware pitchers bearing a brooding portrait of “General Jackson, The Hero of New Orleans” brought the volatile politicians to the dining table. Following Jackson’s win in the 1828 election, housewives could make curtains from a victorious inauguration textile, placing the general among the pantheon of U.S. presidents. In 1840 fervent partisans showed their Whiggish loyalty by purchasing entire sets of dining and teawares decorated with a special pattern in support of William Henry Harrison. 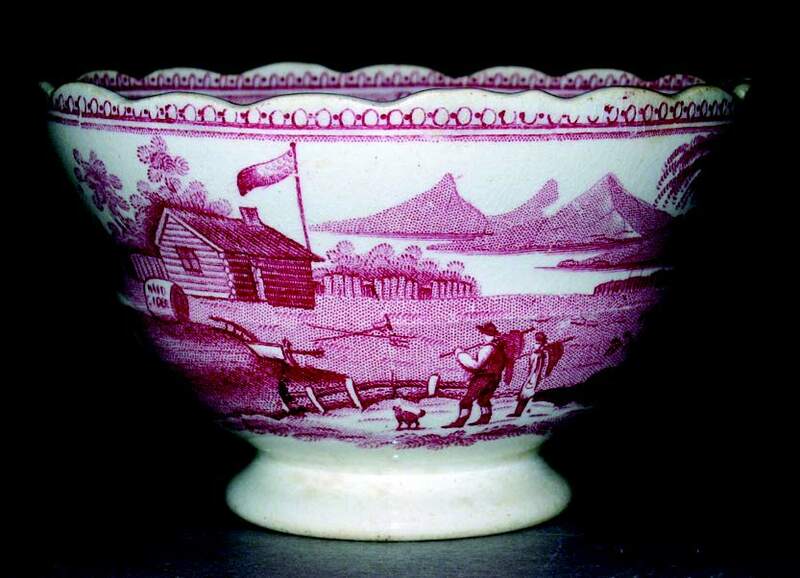 Produced by William Adams and Sons in Staffordshire, England, the pattern was named “Log Cabin,” after Harrison’s iconic residence on the frontier. 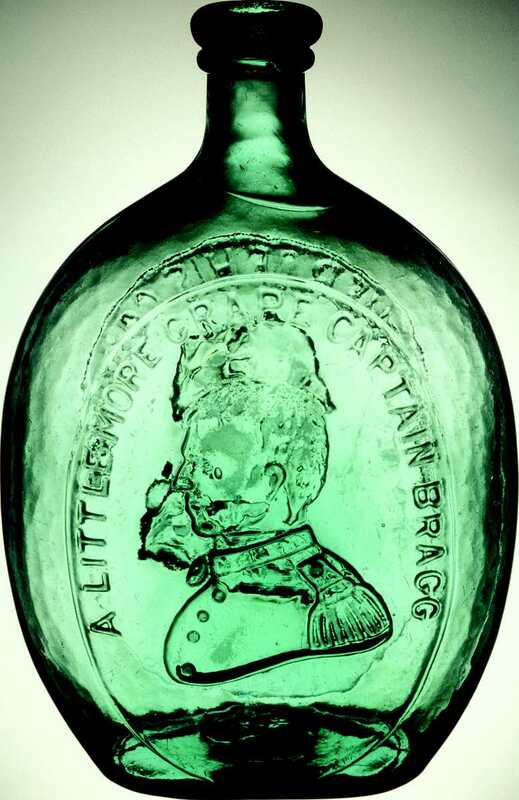 The story of retired General Harrison’s welcoming an injured soldier into his modest home was also printed on bandboxes and molded into glass cup plates for use and display in the home. His log cabin became the logo of the Whig campaign, drawing a domestic connection between the candidate and the electorate. and Sons, Staffordshire, England, 1840. In 1848 another victorious general was running for president. Images of Zachary Taylor and his campaigns in the Mexican-American War were repeated on textiles that draped the homes of his political supporters. 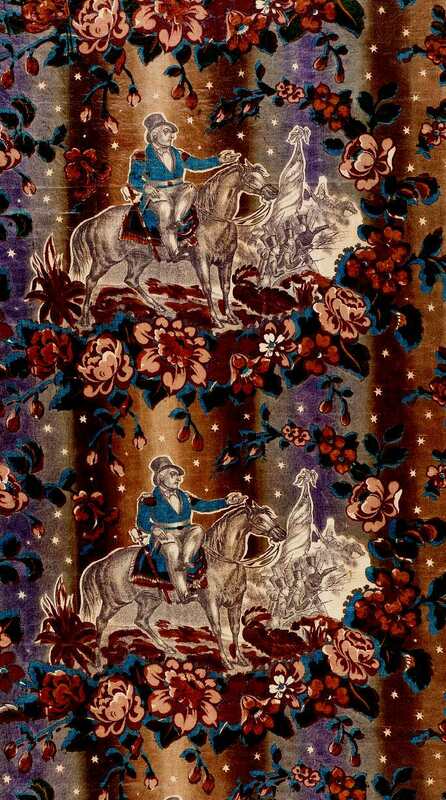 The patterns combined popular decorative motifs with campaign imagery, such as the textile for curtains and quilts that showed General Taylor and his horse, Old Whitey. Although women in the Jacksonian era couldn’t vote, much less run for president, they did find their own ways of participating in political campaigns. 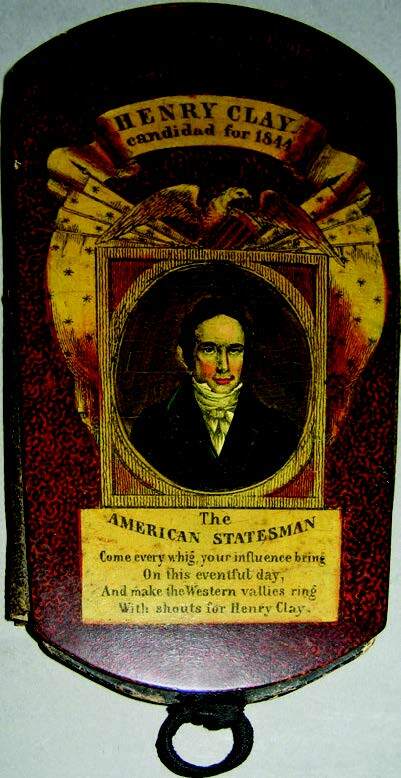 During Jackson’s campaigns in the 1820s, they could purchase, use, and display pin boxes showing support for a candidate. The pincushions on top of each box were stamped and painted with slogans such as “Victory to Jackson,” “Old Hickory Forever,” and “Don’t Forget New Orleans.” Jackson’s portrait was mounted under glass under the lid of each box. Sewing was also a prominent way women were actively involved in campaigns. 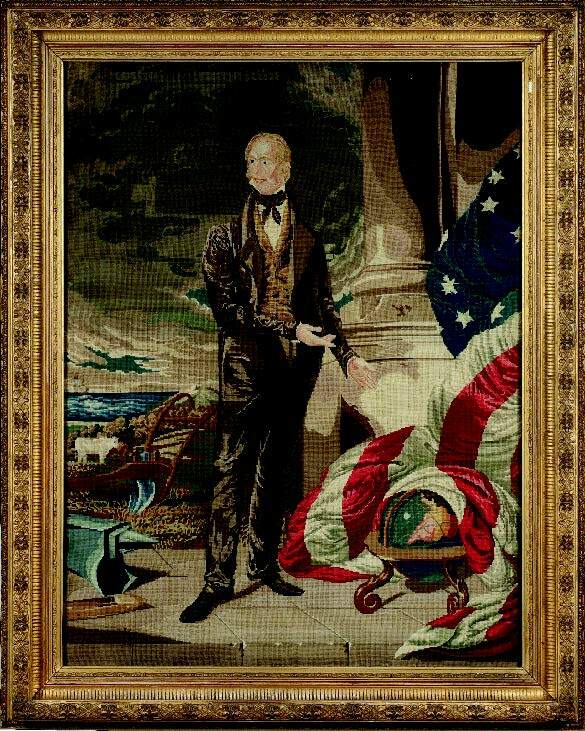 From the blue and red textiles with a pattern of log cabins and William Henry Harrison on wholecloth quilts in the 1840s to a large needlework portrait of Henry Clay made by twelve-year-old Agnes D. Jackson stitchery highlighted not only a young woman’s skill but her political opinions as well. Badges, buttons, ribbons, and personal accessories marked men as partisans and allowed them to carry their candidate with them throughout the day. In 1828 circular tobacco boxes bearing the portrait of General Jackson could be slipped into a pocket or displayed on a desk. In 1844 cigar cases were decorated with the portrait of Henry Clay. If a supporter preferred pipes to cigars, he could purchase a Clay pipe molded with the face of the candidate. “Log Cabin” beaver hats and “Rough and Ready” straw hats also allowed supporters to make their views known. Agnes D. Jackson, Rockaway, New Jersey, 1850.
the portrait of Henry Clay, made in the United States, 1844. As material evidence of partisan enthusiasm, political material culture existed for all citizens, whether male or female. Campaign objects graced shop windows and dinner tables as well as the coats and heads of supporters. Not only markers of inclusion with a specific group, they were the ultimate demonstration of dedication and enthusiasm for a candidate and his party. Post by Lydia Blackmore, decorative arts curator at The Historic New Orleans Collection and a 2013 graduate of the Winterthur Program in American Material Culture. This entry was posted in Academic Programs, American Culture Studies, Decorative Arts, museum collection, Uncategorized and tagged elections, politics, presidential elections, Winterthur Museum. Bookmark the permalink.